Mixer with Heating Jacket for Bitumen Testing - A 6-litre Mixer Used in conjunction with an Iso Mantle, is suitable for mixing samples of asphalt. Bench mounting Mixer, 6 liter nominal capacity. Supplied with bowl, beater and whisk. Motorised with two speed operated on 230 V A.C., Single Phase. ISO MANTLE ELECTRIC HEATER - For use of Bench Mounting mixer. For 230 V A.C. , 50Hz, Single Phase. 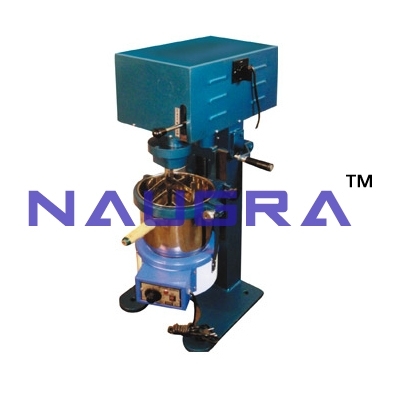 We are leading manufacturers, suppliers & exporters of Mixer with Heating Jacket For Testing Lab for Bitumen Testing Lab. Contact us to get high quality designed Mixer with Heating Jacket For Testing Lab for Bitumen Testing Lab for schools, colleges, universities, research labs, laboratories and various industries. We accept bulk orders for government tenders in all countries around the globe.